Zaki Chehab is one of the Arab world’s leading journalists. He is political editor of the London-based “Al Hayat” and of the Arabic TV channel LBC. For over 25 years he has covered Middle Eastern conflicts for local and Western media, and has contributed to the “Guardian”, CNN, Channel 4 and the BBC. He was the first journalist to broadcast interviews with the Iraqi resistance. Very few observers are able to travel outside the American controlled Green Zone in Iraq, let alone meet members of the resistance. Internationally renowned Arab journalist Zaki Chehab, however, is different. Having grown up in a refugee camp in Lebanon, he knows how to talk the language of people who consider themselves under foreign occupation. As a result, he is able to penetrate the inner structures of Saddam loyalists and Islamist radicals as well as reach out to ordinary people struggling to get by. Now, for the first time, we are able to see an authoritative picture of the Iraqi insurgency in all its complexity, ferocity, and passion. Chehab shows how the resistance fighters really view the post-Saddam regime, George W. Bush and the terrorist phenomenon now known as ‘Al-Qaeda’. As well-connected in diplomatic circles as he is amongst the footsoldiers of Fallujah, he also reveals facets of the occupiers’ strategy never discussed in the West. 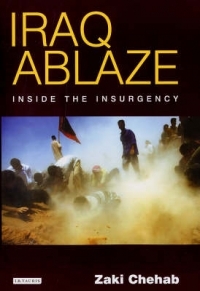 “Iraq Ablaze” is the book that everyone who wants to understand Iraq today, and where it is heading, has been waiting for. Chehab, political editor of London-based al-Hayat, has not produced a comprehensive account of the Iraqi insurgency, but it is the best yet. Zaki Chehab is one of the most respected and accomplished Arab journalists intersecting with the British media. He brings a new perspective to bear on the whole Iraq adventure. Few journalists have had such open access to the secretive world of the insurgents. Chehab's book will not only serve to explain the turmoil of the past year, but also where Iraq is now headed.